A hassle free shopping experience modeled around customer satisfaction is Amazons biggest strength. Based on this Amazon GO and the “Just Walk Out” concepts are unveiled. Amazon has been toying with the idea of entering the offline retail industry for a while now. With the announcement of Amazon GO, we finally get details on how they plan to do this. The online powerhouse plans to build a chain of stores that does not rely on traditional check-outs. You won’t even find a self-checkout. To achieve this you sign in with your phone, when entering an Amazon GO location. Once you’re inside, a mix of “computer vision, sensor fusion and deep learning” will follow what you do while shopping. The system is said to recognize items you take out of a shelf or put back. This way you can “Just Walk Out”, once you’ve collected all the items you intend to buy. Amazon will charge your account based on what you took and send you a receipt. 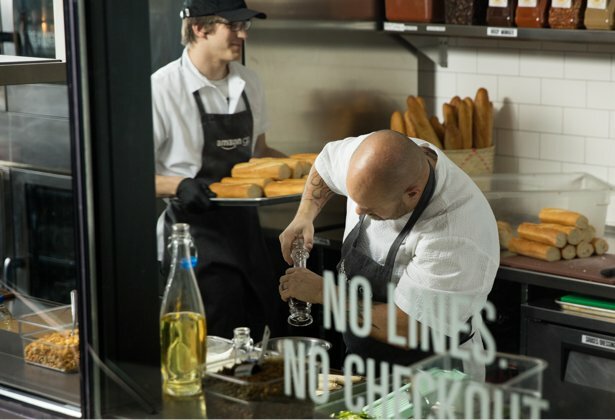 Amazon GO will offer a variety of premade food, aimed at people picking up breakfast or lunch before work or during their breaks. Besides that most things you might need in a grocery store will be sold such as bread, milk and chocolate. One thing that sticks out is the “Amazon Meal Kit”, a set of items with all the ingredients for a meal you can cook yourself. This isn’t an entirely new concept as there are already specialized vendors selling similar products. The question that arises is: How much will this attempt by Amazon impact the business of established retailers? Given the fact that the retail market has always been volatile, we are interested to see how this new concept will play out. The first market to be hit will be the US market, which is already fending off European chains like Lidl and Aldi. While US retailers will have an immediate need to innovate, others will have a greater time frame to react and put their own solutions in place. The greatest advantage Amazon has is its reputation for great customer service, care and quality. While reliability of the “Just Walk Out” system has to be tested, there is little doubt that any snags will be dealt with in a professional and satisfactory manner. Amazon also has a massive infrastructure ready to support a chain of Amazon GO stores. The last advantage is that adapting new technology in existing store points is a lot harder than building them from the ground up. If shoppers will be happy with the hands-off approach, remains to be seen. The way the roll-out seems to be planned (in waves of increasing size), Amazon will probably be able to address any arising concerns. The first Amazon GO location is located at 2131 7th Ave, Seattle, WA and is currently open to Amazon employees for Beta-Testing. It will open to the public in early 2017 for which you can get a notification via Amazon. This entry was posted in discounter, online, retail and tagged Amazon, Innovation, retail.